The Beta Club of Alcorn Central has a fun trip to Biloxi ahead of them. 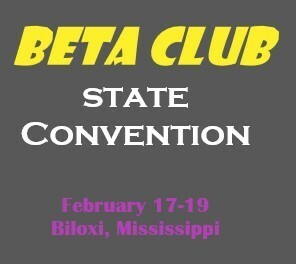 The Mississippi Beta Club Convention will be held at the MS Gulf Coast Convention Center in Biloxi. The Beta Club is under new leadership and has some great things on the horizon. ACHS Beta Club is sponsored by Susan Holt and Darla Nash. Both sponsors took a bright group of students down to Tupelo earlier this school year to sit in on some leadership sessions and to compete in a skills based competition. The competition team won a qualifying spot to the national convention which will be held in Oklahoma City this summer. After a successful fall conference, the club officers teamed up and began to plan a trip to Biloxi. Members of the club were given the opportunity to sign up for competitive events to partake in while on the coast. Students were able to sign up for individual and team events. The events are listed below. The Beta Club has been accepting sponsorships for individuals and companies to become walking advertisements. Please contact susanholt@alcornschools.org for information on how to donate. Thank you for your endless support!